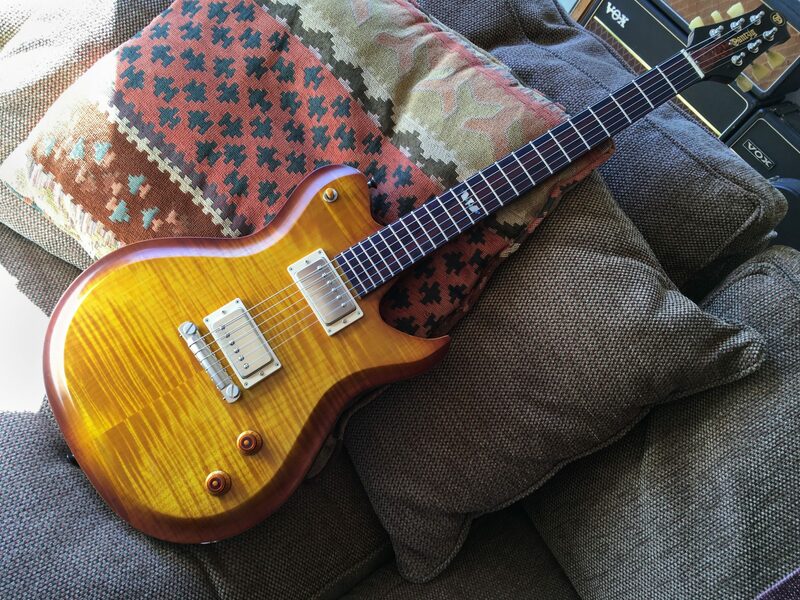 Don’t you wish you could get one of these amazing handmade guitars without waiting? Most of our instruments are built to order, but occasionally we build experimental or “spec” guitars for evaluation. We refer to them as Artist’s Proofs. 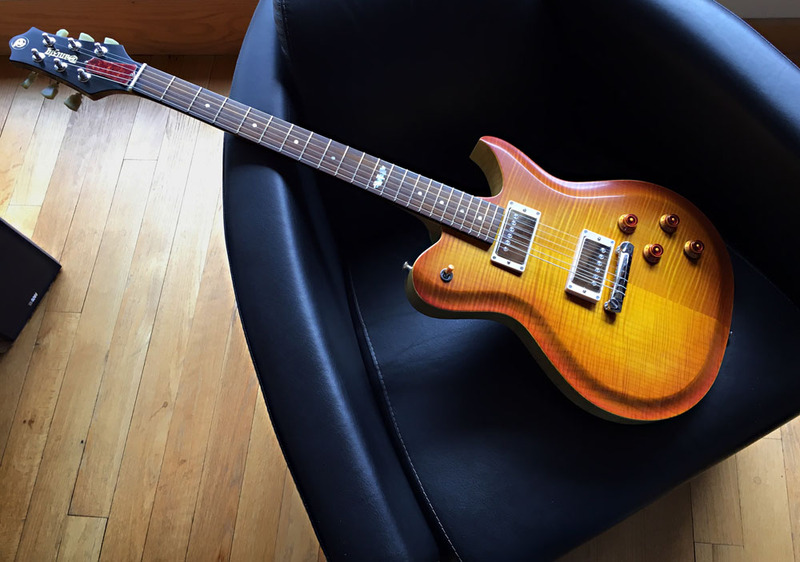 After our review period these guitars are made available on this page. These are essentially one-off instruments for a fraction of a Signature Series cost, and a great way for you to get a unique guitar without waiting (our backlog is currently around 18 months). Just remember that many of these configurations will not be repeated, so if you see something you like, act fast. The Georgia Pine Project was the first set of components that I tested on the newly finished tooling for my Tulsa model. I used pine because it is plentiful and easy to work. It’s not as rare (or costly) as the exotics from Central and South America, or the African woods I normally use, which is good when you are experimenting! I was intrigued by the light weight and buttery color, and decided to pair it with a hard maple neck just like Leo’s prototypes. To my delight it yielded a wonderful tonal palette as well as a very lightweight instrument. German carve figured maple over figured korina body and neck (upgrades) with stunning hand-rubbed violin lacquer finish in amberburst nitro. Rosewood fingerboard with abalone and pearl “Claw” inlay at the 12th fret. Seth Lover humbuckers, nickel hardware including a 30 gram aluminum wraparound bridge. 25.5″ compensated scale. 7 lbs/9 oz. Rock and Roots machine! Artist’s Proof 2017. This luscious example is dripping with tone and weighs in at a manageable 7 lbs-8 oz. Torrified maple top over Honduras mahogany with German carved front and back! 25.5″ scale Brazilian rosewood fingerboard with ultralight milled aluminum wrap bridge. Sperzel open back tuners with Ivoroid keys. John Grail humbuckers for insane vintage tone. Tulsa “Georgia Pine #1” Artist’s Proof guitar 2016. Featuring a 25.5″ scale, aluminum wrap tail, TonePros strip tuners, Custom bridge humbucker/DD single coil neck. You’re going to love the light weight—7lbs/3.5 oz. Used on the Mike Eldred Trio’s East Coast tour. It’s not used—it’s experienced! Number six in a series. You can’t resist a pretty face. German-carved figured maple over German-carved figured korina body and one-piece neck (upgrades) with hand-rubbed violin lacquer finish in ”59 Burst nitro. Brazilian rosewood fingerboard upgrade with pearl dots and abalone and pearl “Claw” inlay at the 12th fret. Two NOS Lollar Imperial humbuckers from 2007, nickel hardware including a 30 gram aluminum wraparound bridge. 25.5″ compensated scale. 7 lbs/15.5 oz. This baby ROCKS! Third in a series. You’ll be amazed to see this one in person— German carve figured maple over figured korina body and neck (upgrades) with stunning hand-rubbed violin lacquer finish in amberburst nitro. Brazilian rosewood fingerboard upgrade with abalone and pearl “Claw” inlay at the 12th fret. Two Grail humbuckers, matte nickel hardware including a 30 gram aluminum wraparound bridge. 25.5″ compensated scale. 6 lbs/15 oz. Sings like a bird! 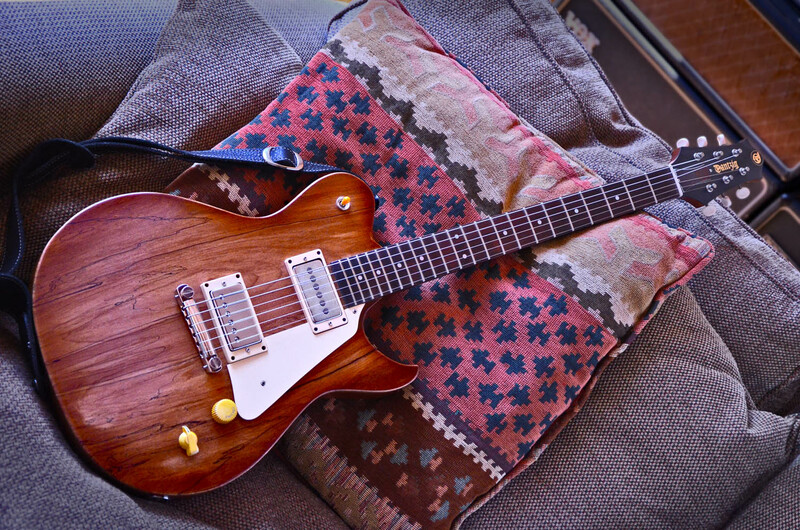 If you are looking for a great sounding, great playing, workhorse guitar, look no further. This is the second Pine Project Tulsa—used to dope out new tooling and construction ideas now utilized in the line. Multi-lam lightweight pine body with natural matte lacquer finish. Rosewood fingerboard with abalone and pearl “Claw” inlay at the 12th fret. Two Duncan special wind lo-output humbuckers, nickel hardware including a lightweight aluminum wraparound bridge. 25.5″ compensated scale. 6 lbs/15 oz. Punchy as hell!